The Palms 611 - Corner Unit! Book now for the best Spring rates! Ready for elegant island living in a relaxed atmosphere? Find it all in this beautiful 6th floor end unit with over-sized wrap-around balcony! Recently renovated and redecorated, it has nine foot ceilings and tiled flooring throughout with area carpeting. Approximately 1400 sq.ft., the unit features a spacious living room, dining area, full kitchen, three bedrooms, and three baths. The large living room features a full view of the beach and Gulf, sofa, love seat, sitting area, and brand new flat screen TV and DVD. The dining area has a full size dining table with comfortable upholstered dining chairs seating 8-10, with additional seating on the balcony. The large fully equipped kitchen includes microwave, oven, dishwasher, disposal, refrigerator w/ice maker, toaster, coffee maker, waffle iron, blender, can opener, dishes, cookware, glasses, and utensils. Also includes plenty of large serving dishes for entertaining. There's a convenient bar area with stools, full size washer and dryer, and a full size ironing board and iron. WiFi also available!! Enjoy new flat screen TVs and DVDs in each bedroom! The master bedroom has a king size bed and private bath with large soaking tub. The second bedroom has a queen size bed, and the third has two twin beds. 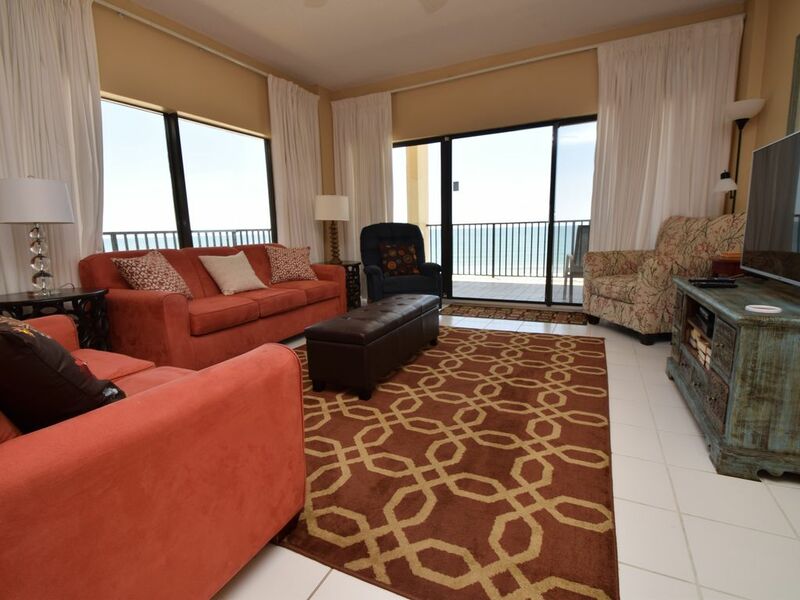 All bedrooms have sliding glass doors to balcony for Gulf front view, flat screen TV, DVD and clock radio. All three bathrooms are spacious and include installed blow dryers. The huge Gulf front balcony overlooks the beach and oceanfront pool and has a large table and chairs and several chaise lounges - perfect for taking in the sights and sounds of the Gulf of Mexico. Two elevators quickly take you down to enjoy sunning by the outdoor pool on the beach front, or escape from the sun on those chillier days at the indoor heated pool. Both have restrooms conveniently located for guests. Private boardwalks lead to one of the largest beach areas on the coast where umbrellas and padded lounge chairs are available for rent. Outdoor showers are located at each boardwalk for leaving the sand on the beach! The fitness room is equipped with a treadmill, weight equipment, stair machine and flat screen TV to get you through a tough workout! After your swim or workout, reward yourself with a relaxing dry sauna. Elevated, lighted tennis courts are above the covered parking area. There is also an area to grill steaks and any fish you may have caught. For those with their own boat, there are convenient accommodations directly across the street. The Palms is situated in a prime location and just a few short blocks to three large grocery stores, four pharmacies, ABC store, restaurants, movie rentals, spas, and shopping. The Tanger Outlet Mall offers great retail therapy with over 120 brand name stores for those occasional rainy afternoons. Swim with the dolphins at The Wharf. It also has an amphitheater for regularly scheduled concerts, more shopping, and a movie theater. Perdido Pass offers a new area just for fishermen. Marinas, glass bottom boats, chartered deep sea fishing, golf (big boy and miniature), Alabama Birding Trail, amusement parks, and water theme parks are all just a few short minutes away. Ask for our personal listing of points of interest in the area (conveniently segregated into categories such as entertainment, grocery, medical, personal care, professional services, rentals, shopping and so forth; not recommendations but a compilation of those we have frequented or heard of). If you are looking for a romantic getaway, a family retreat, or respite from the everyday hustle and bustle, you will love our condominium at The Palms as your next vacation choice. We assure you there will be no disappointments! We will strive to make your stay comfortable, stress free, and memorable. We look forward to establishing many long standing relationships. We have noted all of the issues you listed and given them to the owner. We hope to see you again next fall! Loved the condo! View was spectacular from every angle. Had grandkids with us. Felt very safe with them using the facilities. Both pools were nice and well maintained. Unit was very clean and comfortable. Overall, adequate, convenient, comfortable. Needed some upkeep. Kitchen well equipped. Doors to laundry equipment out of kilter and would not close. One of our guests was able to adjust the doors with a purchased screw driver in about five minutes. The handle on the sliding glass door needs repair. Sliding glass door in the bedroom would not open. Tile on kitchen floor has a hole. Water in one bathroom would not adjust properly. The place needs a good handyman! #611 was nice, plenty of room, beach access is perfect. Kitchen does need an upgrade, especially the counter tops, cabinets, and refrigerator. Loved the balcony and view. I made a few suggestions to the Poole Associates. The outside door to the patio had a loose pull handle that got stuck once as someone pushed the lock mechanism accidentally while pulling it to. It did cause a little angst to the one who might be alone sometime and find herself locked out. The handle has an automatic timer with the air unit to make sure the unit goes off when the door is left open. Maybe an expensive fix that they have put off. Also the inner shower liners were not replaced clean. I mentioned that to Poole, so it is probably taken care of by now. It might need a few updates, but in general, we were quite satisfied.. You can see out the side to the ocean from the dining table. Also, the outside table was nice touch, only possible because of the length and depth of the balcony. You can see the sunrise, but not the sunset from The Palms. The water is not as green and clear as in Destin, but it might have been because of the hurricanes. A ridge of two to three feet of sand separated the shore from the upper beach and was hard for some to navigate to the water edge. Very nice umbrella and chair concession on the beach front. $130 a week for two reclining full length chairs and umbrella. The young man who worked there came around to move the umbrella as the sun moved. Additional fees not included in rates.